Mythological Fruit or Lost National Treasure? When I first came to Greece in the early eighties it was a vastly different place. Since then so many things have changed — for the better and worse — before we even get to its economic troubles today. It always easy to look back and see a kinder, simpler time and let sentiment cloud judgement. Back then I was a twenty year old English girl who grew up on fresh fruits and vegetables from the local greengrocer (not a supermarket) including seasonal Canary Island tomatoes and home grown tomatoes from my dad’s greenhouse in August. Canary tomatoes are small, uniform, and not particularly special, but they sliced up beautifully in perfect little segments on a salad. When I first saw a Greek vegetable stand the lemons were piled high with leaves still attached and knobbly, misshapen bright red tomatoes were everywhere. When you cut them open, they were red through and through, juicy, sweet, and full of seeds which seemed to randomly cluster throughout the flesh of these tomato monsters. Quite frankly, they looked a bit weird. Cut up on a Greek salad they were easy to eat because they tasted so good, but they shook my limited definition of what a tomato should be. Flash forward twenty five years and I am beginning to doubt that those tomatoes ever existed in Greece. Now they seem impossible to find, and have been replaced by large, uniform fruit that look impressive and much more perfect, but cut them open and — I’m sorry — they are just not Greek enough. 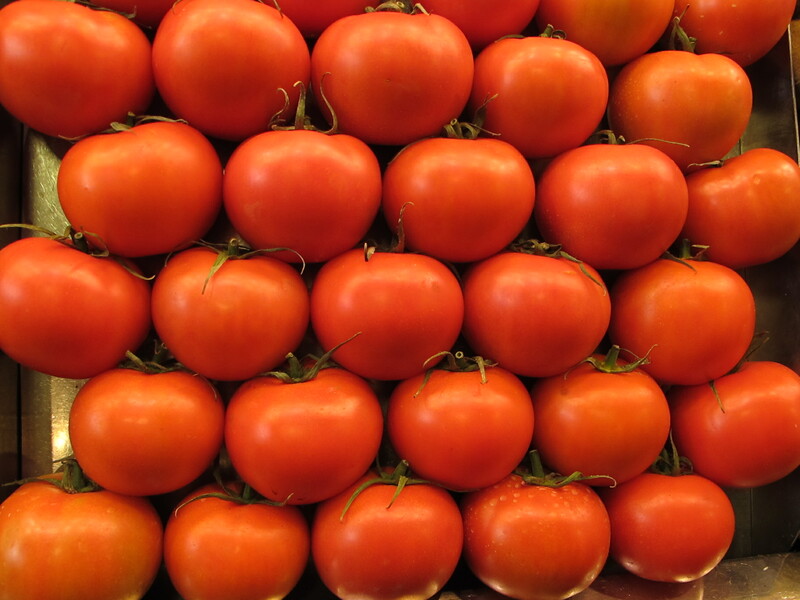 I’m told time and time again that “so and so” has fantastic tomatoes this season, and off I go to buy some. Only to be disappointed in what I find. So much so, that I’m starting to question whether I have idealized them to the point that no mere tomato can ever live up to my expectations? I’ll illustrate this with a story. My husband loves the Greek dish, Macaroni me Kima. Its a Greek version of Spaghetti Bolognese with the distinctive addition of cinnamon. The basic recipe is not complicated and there’s not that much variation on how to make it. I would make it for him and ask how he liked it and he would always say “its very good, but its not like Maria’s”. He could never tell me what Maria did to make it so good and she wasn’t around to ask. I tried numerous versions of the recipe, but as I say that’s not that much room for variation. From time to time I would ask a Greek friend (or better still her grandmother) to show me how to make it. Every time the preparation seemed pretty standard to me and Robert’s reply was the same: “very good but not like Maria’s.” It literally took me 15 years to realise that it was not Maria’s skill as a cook that my dish missed, but the long hike to her house and the hard work outside in the Greek sun that preceded the reward of her Macaroni me kima lunch. It was the context and sentiment that my recipe lacked. So, my question to myself was whether this was happening here with my elusive Greek tomato? These are tomatoes?! You have to friggin’ be kidding me! I would be embarrassed to give these away. Perfect, shiny and a beautiful red. Buy me it screams…but look at the cut away. That white ring is a good sign its tasteless and probably mealy too. No thank you! I’m not obsessed with this….really! 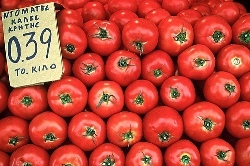 I went to buy tomatoes last week from a local grocer who has fresh produce three times a week. She is a lovely woman and I don’t question her sincerity one bit. She told me the prices of two types of tomatoes she had and one was twice the price of the other as it was the better product. The more expensive variety was mostly green and had the shiny, plastic appearance of wax, the hallmark of something raised in a greenhouse. I asked her if they were imported as that might account for the difference in price. But no, the box showed they were Greek. Really?! Here we are in August, in Greece, and this is the best you have on offer? Something is really wrong here. 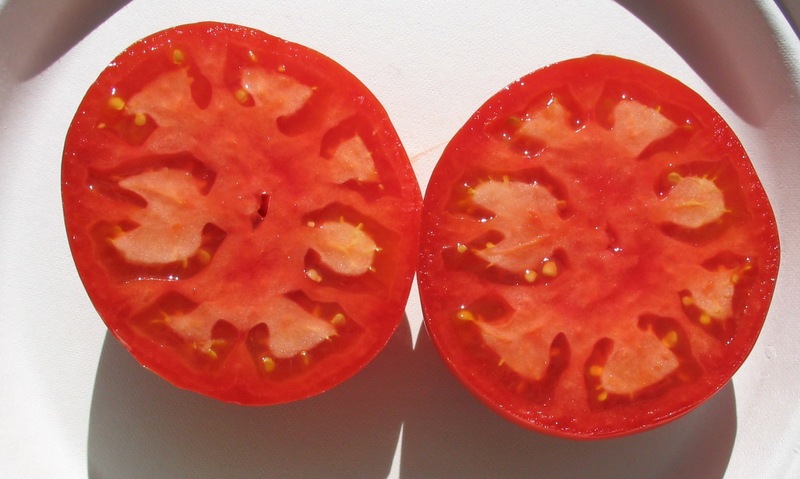 Has everyone bought into this myth that perfect-looking tomatoes must be better? Am I the only sane one left?! I don’t think its me. I don’t think that the Greek tomato of the 80s and 90s is a myth in my mind. I think its demise is the work of the bastards at Monsanto and other giant seed companies who are messing with our food, messing with our culinary heritage and messing with our seed stocks. Its heartbreaking to know that profit is driving them to purchase traditional seed stocks with the intention of discontinuing them permanently, so they disappear from our tables forever. 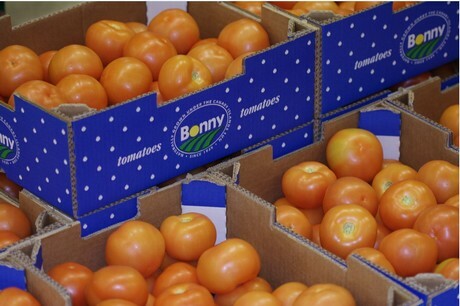 The replacement is proprietary, hardy seed stocks which produce perfect-looking produce that resist disease and transport better at the price of quality and taste. People buy into the glossy perfection of perfect produce and forget about taste. How else could I ever explain the grocer’s honest belief that she was selling me a better product? But I still live in hope that one day I’ll bump into an old farming family in the corner of a laiiki somewhere who will sell me tomatoes from his grandfather’s seeds that really taste like a Greek tomato. If this ever happens, I don’t know that I’ll even eat them. I may just scrape out the seeds and save them and start my own subversive tomato farm somewhere. Someone has to save this national treasure if it hasn’t already gone forever! Great post Caroline … In the 10 years now we have been living in England, I can count on one hand the number of times Jay has actually approved the tomatoes I put on our table.He harks back to the mountains of tomatoes in his childhood market which you could buy for next to nothing. You are right about uniformity and colour taking precedence over taste. I blame the EU :-). On a happier note, he says I can now make Turkish rice as good as his mother … lol ! I’m with Jay and its totally the EU’s fault (and their collaboration with the seed suppliers). I was talking about tasteless tomatoes just a couple of days ago, Caroline. 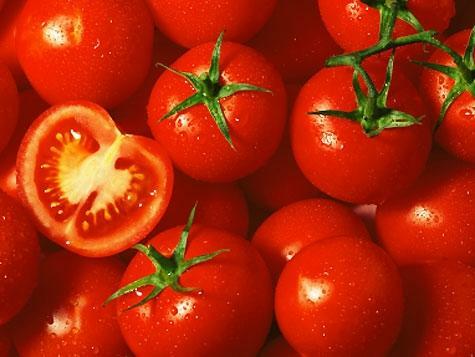 We used to grow our own when I was a kid and I could pick a tomato from the garden, cut it in half, add some salt and it was packed with flavour. Now many or most tomatoes seem dry and tasteless.